August 9, 1972, a little over 43 years ago, “All The Young Dudes” climbs into the New Musical Express’ Top 30 at a modest 29. Glamrock is the latest fad, Bowie rules with his “Ziggy Stardust” album and Alice Cooper tops the singles charts with “School’s Out”. Mott The Hoople is a new name for most people, the song is written by Bowie, sounds like a mixture of the “Ziggy”-album’s opening and finale (“Five Years” and “Rock’n’Roll Suicide”), sporting a glorious singalong chorus pouring out from behind verses that are unconditionally adaptable to the frustrated post-Beatles generation. An apocalyptic hymn (that would not have been out of place in “A Clockwork Orange”) and a glam rock’s call to arms, sung by a mysterious guy who already had turned 33 and was older than all of the ex-Beatles. It is a perfect recording from start to finish, the adrenaline burns in a whoosh of guitars and wailing backing vocals, and Ian Hunter’s flamboyant phrasing set the standard for the entire British glamrock genre and its neighbouring counties (say hello to Steve Harley). What people didn’t know was that Mott The Hoople were an old band, a bunch of worn toilers who had soldiered through the club circuit for ages without getting anywhere. They had four albums of varying quality on their conscience, all released on the Island label. I discovered them back in 1969 on the cheap-o sampler “Nice Enough To Eat”. Mott’s mighty, forever droning version of Doug Sahm “At The Crossroads” was a true delight and whetted my appetite for more. I bought their debut album with its fascinating Escher sleeve. At the time Hunter looked like a “Blonde On Blonde”-sleeve outtake and sounded more like Dylan on amphetamine than the androgyne whizz kid on “Dudes”. I bought all their albums the moment they were released, but Mott never managed to find the redeeming formula, although parts of their fourth album, “Brain Capers”, were close. And then they gave up. It turned out, however, that David Bowie was a fan. When he heard that Mott was imploding, he offered them “Suffragette City” from the still not released “Ziggy” album. The group declined. A wise decision it turned out to be, as Bowie was not willing to take no for an answer. According to the myth he simply composed “All The Young Dudes” on the spot, sitting cross legged on the floor strumming his guitar, in front of a baffled Ian Hunter. And would they like him to produce their next album? The revitalized Mott The Hoople was ready for the world. 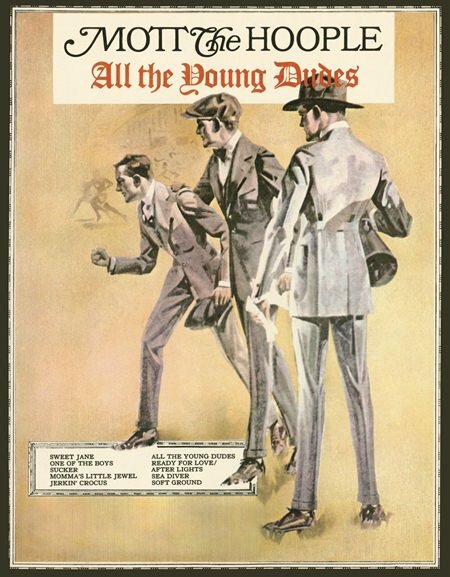 “All The Young Dudes” never got any higher than #3 on the British charts. But the recording would prove to be so durable that it sounds just as triumphant and relevant today, 43 years later. And though Bowie repeatedly tried to steal it back, Mott The Hoople’s version will forever stay the defintive one. I am so old that I’ve had the pleasure of seeing Mott The Hoople (with Mick Ronson) perform it back in 1974, and Ian Hunter doing the same thing at the Hammersmith Odeon in 1979. Back in the real old days. I guess you can call me lucky. As for the album that took its name from that classic piece of 45 rpm vinyl, it doesn’t quite match its namesake. In fact, some of the tracks probably were meant for an aborted fifth Island- album. However the album does include a handful of strong tracks that point towards Mott’s key works, “Mott” (1973) and “The Hoople” (1974). The cleverly subdued version of Lour Reed’s “Sweet Jane” is a humdinger, and so is the call to arms “One Of The Boys”. The romantic mystic Ian Hunter delivers the dark beauty “Sea Diver”, and in “Mama’s Little Jewel” he proves yet again that as a Dylan impersonator, he is in a league of his own. The album offers Mick Ralphs plenty of space for his Stones like riffing and tense, ringing solo-runs. He is also responsible for one of the album’s best tracks, “Ready For Love”, which he sings himself. “All The Young Dudes” is not the best Mott The Hoople-album, far from it, but it did what it was supposed to do. It saved the band, or rather delayed their disintegration long enough for them to record two of the greatest albums ever made by a British rock’n’roll-band – and turning Mott The Hoople into a legend. Ian Hunter is still performing (and recording excellent albums). 76 years old. God bless him.